With just a few minutes left in our recent visit to a nearby bounce emporium, Clay was showing no signs of slowing down and little interest in our warnings that we needed to leave soon. A local group, the Autism Cares Foundation, has been funding a once-a-month session at a Bounce U, which is filled with huge sliding boards, mazes, moon walks, every kind of blow-up-bounce-on-me-type of equipment you can imagine. We joined them for the first time last week. Clay was having the time of his life, jumping and flinging his body around on one piece after another. All 10 or 12 of the kids were doing the same. It’s amazing to watch kids with autism go at this sort of equipment. Clay is particularly insatiable, bouncing with abandon. Doesn’t matter whether you are supposed to be sliding or climbing, he finds a way to fit in some pinball action. A couple of times I had to shoo him out of the basketball area, where he was rolling around on the padded mats. When he was younger, we bought a mini-trampoline. Clay would bounce so high, we had to move him outside to protect our ceilings (and his head). He wore out three of them. 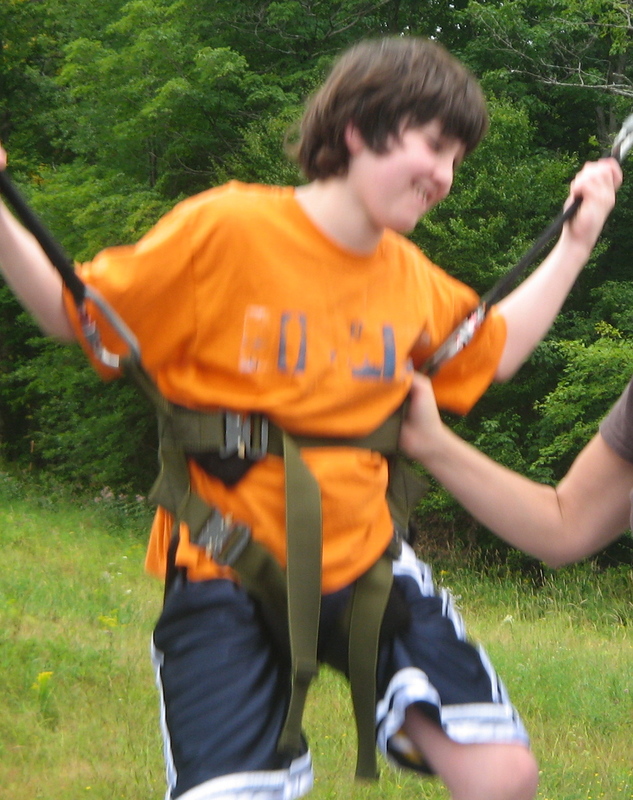 Once in the Berkshire mountains a few years back, we put him on a trampoline that had a harness, and he nearly launched himself out of the Earth’s atmosphere. In the final minutes of this session, Clay discovered a monster sliding board with a big landing area where he could bounce around. No need to climb the ladder and slide down—although he did that a few times with my help. It was enough to slam his body like a jack hammer in the padded landing area. It took two of us, but we managed to coax him out of there and into his shoes and coat as our time ran down. What did he think afterwards? “So much fun,” he typed on the keyboard he uses to communicate. Looks like we’ll be back next month. This entry was posted on March 21, 2011, 12:59 pm and is filed under Communicating, Silly Behaviors. You can follow any responses to this entry through RSS 2.0. You can leave a response, or trackback from your own site. So glad Clay has something to do regularly that he enjoys, and in which the whole family can participate! Clay’s comments about how it relaxes him reminds me of Temple Grandin and the squeeze machine she constructed for herself. Somewhere in my reading I came across the suggestion of using pj’s one size smaller to help relaxation at bedtime. Glad everyone is doing so well.